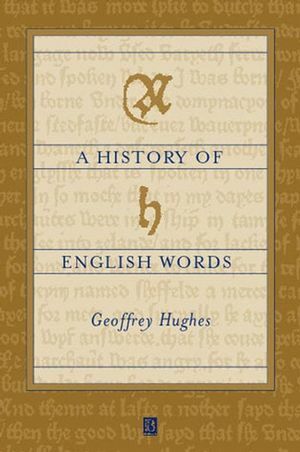 This book traces the remarkable reconfigurations that English lexis has undergone in the past millennium. The vocabulary is studied as an indicator of social change, a symbol reflecting different social dynamics between speech communities, on models of dominance, cohabitation, colonialism and globalisation. Comprehensive guide to the evolution of the English vocabulary. Well known passages from literature are used to illustrate the variety of English words. Accessible discussion of Latin, Greek, Germanic and Norman-French languages. Contains original research into the make-up of the current lexical core of English. Geoffrey Hughes is Professor of the History of the English Language at the University of the Witwatersrand in Johannesburg, South Africa. A graduate of Oxford University, he has held academic and research posts at Cape Town, Harvard and Turin. His main interests are in historical semantics and sociolinguistics on which he has written over twenty papers and two books, Words in Time (Blackwell, 1988) and Swearing (Blackwell, 1991). He is a consultant for the Collins Dictionaries on South African English and has been editor of the journal English Studies in Africa. List of Sources and Abbreviations. A Chronology of the English. 1. History in the Language: The Vocabulary as a Historical Repository. 2. The Foundations of English and the Formation of the Base Register. 3. The Norman Elite and the New Language of Power. 4. The Lexical Expansion of the Renaissance. 5. Licentiousness, Decorum and Lexicographical Order; A Short History of the Dictionary. 6. The Lexical Interchange of Imperialism. 7. Lexical Varieties in Modern and Contemporary English. 8. Changes in Lexical Structure. "Socialinguists will find the work a useful departure point for research and teaching, particularly where it deals with areas outside their current expertise, and students and generalists will find it a good read and highly informative throughout." Elizabeth Falsberg, English, University of Washington.